This paper proposes a method for creating 3D occupancy grid maps using multi-layer 3D LIDAR and a swing mechanism termed Swing-LIDAR. The method using Swing-LIDAR can acquire 10 times more data at a stopping position than a method that does not use Swing-LIDAR. High-definition and accurate terrain information is obtained by a coordinate transformation of the acquired data compensated for by the measured orientation of the system. In this study, we develop a method to create 3D grid maps for autonomous robots using Swing-LIDAR. To validate the method, AR Skipper is run on the created maps that are used to obtain point cloud data without a swing mechanism, and 11 sets of each local map are combined. The experimental results exhibit the differences among the maps. Y. Takita, “Creating a 3D Cuboid Map Using Multi-Layer 3D LIDAR with a Swing Mechanism,” J. Robot. Mechatron., Vol.30, No.4, pp. 523-531, 2018. R. Triebel, P. Pfaff, and W. Burgard, “Multi-Level Surface maps for Outdoor Terrain Mapping and Loop Closing,” The Proc. of the 2006 IEEE/RSJ Int. Conf. on Intelligent Robots and Systems, pp. 2276-2282, 2006. J. L. Martínez, J. González, J. Morales, A. Mandow, and A. J. García-Cerezo, “Mobile robot motion estimation by 2D scan matching with genetic and iterative closest point algorithms,” J. of Field Robotics, Vol.23, No.1, pp. 21-34, 2006. A. Desai and D. Huber, “Objective Evaluation of Scanning Lidar Configurations for Mobile Robots,” Proc. of the 2009 IEEE/RSJ Int. Conf. on Intelligent Robots and Systems, pp. 2182-2189, 2009. T. Yoshida, K. Irie, E. Koyanagi, and M. Tomono, “An Outdoor Navigation Platform with a 3D Scanner and Gyro-assisted Odometry,” Trans. of the Society of Instrument and Control Engineers, Vol.47, No.10, pp. 493-500, 2011. K. Kimoto, N. Asada, T. Mori, Y. Hara, A. Ohya, and S. Yuta, “Development of Small Size 3D LIDAR,” Proc. of the IEEE Int. Conf. on Robotics and Automation (ICRA), pp. 4620-4626, 2014. M. Saito, K. Kiuchi, S. Shogo, T. Yokota, Y. Fujino, T. Saito, and Y. Kuroda, “Pre-Driving Needless System for Autonomous Mobile Robots Navigation in Real World Robot Challenge 2013,” J. Robot. Mechatron., Vol.26, No.2, pp. 185-195, 2014. K. Okawa, “Three Tiered Self-Localization of Two Position Estimation Using Three Dimensional Environment Map and Gyro-Odometry,” J. Robot. Mechatron., Vol.26, No.2, pp. 196-203, 2014. T. Suzuki, M. Kitamura, Y. Amano, and N. Kubo, “Autonomous Navigation of a Mobile Robot Based on GNSS/DR Integration in Outdoor Environments,” J. Robot. Mechatron., Vol.26, No.2, pp. 214-224, 2014. M. Yokozuka and O. Matsumoto, “A Reasonable Path Planning via Path Energy Minimization,” J. Robot. Mechatron., Vol.26, No.2, pp. 236-224, 2014. Y. Takita and H. Date, “Actualized Autonomous Functions by Smart Dump 3,” J. of the Society Instrument and Control Engineers, Vol.49, No.9, pp. 636-636, 2010. H. Date and Y. Takita, “Real World Experiments of Autonomous Mobile Robot Smart Dump – Influence and Countermeasure of Human Crowd Behavior in a Pedestrian Environment –,” J. of the Robotics Society of Japan, Vol.30, No.3, pp. 305-313, 2012. O. Wulf and B. Wagner, “Fast 3D Scanning Methods for Laser Measurement Systems,” Proc. of 14th Int. Conf. on Control Systems and Computer Science (CSCS 14), pp. 312-317, 2003. H. Surmann, A. Nüchter, and J. Hertzberg, “An autonomous mobile robot with a 3D laser range finder for 3D exploration and digitalization of indoor environments,” Robotics and Autonomous Systems, Vol.45, No.3, pp. 181-198, 2003. 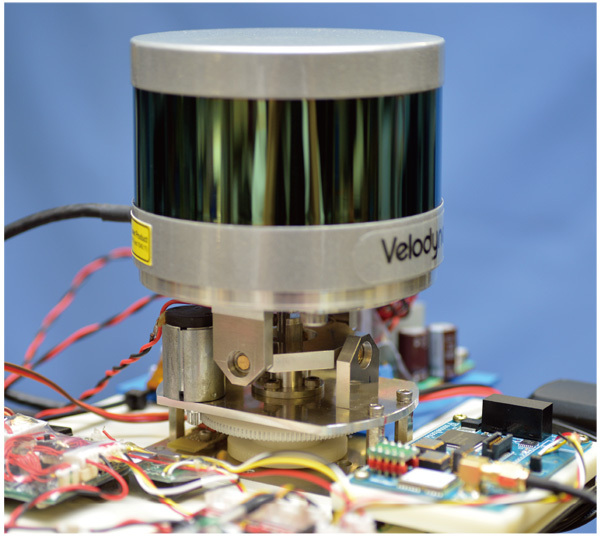 K. Ohno, T. Kawahara, and S. Tadokoro, “Development of 3D Laser Scanner for Measuring Uniform and Dense 3D Shapes of Static Objects in Dynamic Environment,” Proc. of ROBIO 2008, pp. 2161-2167, 2009. M. Matsumoto, T. Yoshida, T. Mori, and S. Yuta, “3D SOKUIKI Sensor Module by Roundly Swinging Mechanism and SCIP 3D Command System,” Trans. of The Japan Society of Mechanical Engineers, Series C, Vol.75, No.760, pp. 186-195, 2007. Y. Takita, “Generated Trajectory of Extended Lateral Guided Sensor Steering Mechanism for Steered Autonomous Vehicles in Real World Environments,” J. Robot. Mechatron., Vol.29, No.4, pp. 660-667, 2017. Velodyne Inc., VLP-16 User Manual and Programming Guide 63-9243 Rev A.pdf, p. 45, 2015. Y. Takita, S. Ohkawa, and H. Date, “Recognition Method Applied to Smart Dump 9 Using Multi-Beam 3D LiDAR for the Tsukuba Challenge,” J. Robot. Mechatron., Vol.27, No.4, pp. 451-460, 2016.